I'm a tea lover but when I see a coffee like this, I just can't resist it. Coffee high mucky mucks can get into the special language trap and that puts people off. Except occasionally I play coffee bar for visitors, just so they can see what coffee really ought to taste like. This is Allison from Maui, A coffee Addict.There’s no way you could live without your morning cup of coffee. Even on weekends, when you wake up a couple of hours later, you can already feel the headache creeping on you.Does this sound familiar? Are you one of the many coffee drinkers that have become addicts? 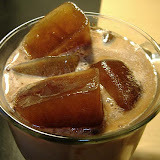 Here i can advice you to prefer the perfect Kona coffee. Without a doubt, one of the world’s most sought-after beans by coffee connoisseurs! This 100% Pure Kona Coffee has a medium to full body and mild acidity. This coffee is from coffee trees grown in the rich, volcanic Hawaiian soil, and warm tropical air. This is a world class coffee, with a rich flavor, low acidity and wonderful aroma. So check your options. I’ll be back with more as time allows. I'm a very big coffee drinker and when I do drink, it has to light in color and heavy in caffeine. 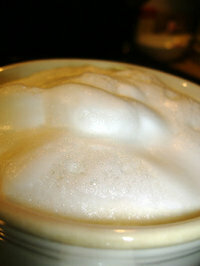 i love your idea of the foam ~ i also love the idea of vanilla and/or cinnamon ~ yum! drink more coffee, so you'll be more energetic! For all you coffee lovers out there, check out these coffee deals. Froth is cool! Makes it sinfully good. Foam rules. Am too a snob. www.jacksoncoffeeco.com Jackson Coffee Co in Jackson, Michigan makes a great foam cap. I believe i'm a coffee snob but hey, theres nothing wrong with that! You know I love foam specially of cappuccino and cafe late. And I love it. I loved your story about "coffee snobs." I, myself, prefer foam over sweetening my coffee. Just out of curiosity, have you ever put foam on an espresso shot? I tend to do that from time to time and get called a pansy for not taking it how it is. So the key is where were you when you had the argument? Starbucks or at Quicktrip? Do you like those Quicktrip chocolate corn syrup coffee drinks you can get as a fake foamed latte - you know the ones that are 25% coffee and 25% creme and 50% sugar? And whats your thought when you see somebody holding one in the morning? Trying to grade your level of snobbishiness to see if we can invite you to our club and send you a special child painted and hand crafted coffee mug - which would fix another blog too. THE FROTH! The first of the coffee the lips touch! to have 'the journey' begin with the most important - first 'sip'! Personally - I agree. Roasting your own coffee is the only way to go. Nothing compares to the freshness; the ability to roast it how you like it...its the best. Never use Kona and Blend in the same phrase. It's taboo! considered perfect to their taste only and, not necessarily perfect to the coffee drinking community. I would like to suggest a perfect cup (to my taste) and suggest you might give it a go also. Try the Kona blend. I don't mean the 90% whatever to 10% Kona, I mean 50% good Arabica bean and 50% Kona. If you have problems finding this blend, try www.mochamack.com. Happy cupping! I don't roast my own beans but am super fussy about the bean I purchase and how they're stored. Each morning I make our espresso, usually to enjoy a cappuccino. 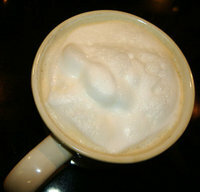 I love the steamed foam, especially when it's the consistency of melted marshmallows! But, I've never thought of sweeting the milk first. I may try that. Thanks for the tip. Coffee snobs rock the world! You don't sound like a coffee snob to me, just a connoisseur. Heh, I hear what you're talking about. My family's a bit that way too, but some of em have been a bit more receptive to learning about what kind of coffee to drink and how to brew it. I try to encourage them to learn a bit more about that thing they drink every morning. Thanks so much for your kind comments folx, you warm the cockles of my heart! I see you site is very very good. I read it many times. I like it very much. I want to share my Blog. My blog is at http://tea-and-tea.blogspot.com. I will be pleased if we have links Exchange together. I am very impressed with your blog and your integrity in the world of tea. This looks magnificent! Gosh, it's good to have you back! I too am glad to see you back to blogging. You are NOT a coffee snob, you just happen to know for sure what you like. So happy to see you posting again. I really missed you. Froth! Love it. I've found adding a little liquid Coffeemate creamer to the milk also makes the milk froth better. I'm no purist, either, or I wouldn't use a creamer! Creamer adds a little sugar and extra flavor. Creme Brulee creamer is also quite good mixed with milk. I use 2/3 fat free milk to 1/3 creamer.